Fleet managers are pushing for more economical unit operation, driven by the goal of longer intervals between planned turbine outages. Achieving that goal often hinges on analyzing damage, determining failure mechanisms, correcting root causes, and choosing appropriate maintenance and operation actions to keep the asset online longer. A steam path audit can help ensure reliable and efficient turbine performance by providing a detailed inspection of all steam path components. Damage to critical parts is a top cause of steam turbine unavailability and can result in costly repairs. Quantifying the losses and knowing the cost to repair or replace damaged parts helps the owner focus on actions that deliver the best rate of return. MD&A offers both efficiency and structural audits. MD&A routinely carries out the audit with other planned outage activities. Recently, MD&A performed an efficiency steam path audit on a 184-MW single-reheat, tandem-compound, triple-exhaust steam turbine. The audit identified steam cycle performance losses in excess of $870,000 in annual fuel costs. Roughly half the losses were in the high-pressure casing. One of the largest losses stemmed from surface roughness. Poor water chemistry control allowed impurities into the steam. 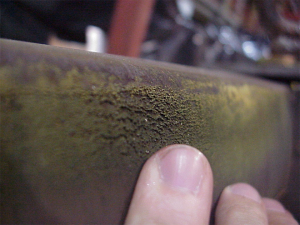 These impurities precipitated out onto the turbine blading surfaces and caused deposits that decreased stage efficiency. If restored to the original new-and-clean surface finish, the surface roughness would have been 64 micro inches centerline average (cla), nearly a mirror finish. The expected finish after grit blasting was approximately 100 micro inches cla, no longer a mirror finish and somewhat granular. Solid particle erosion on the control stage and the first IP stage was found to cost more than $95,000 per year in fuel costs. MD&A recommended that the owner consider sliding pressure operation to reduce the chance of future erosion. The audit offered tabular performance results to help justify replacing packings and seal strips on a stage-by-stage basis. The audit also found potential leakage around packing boxes. This type of leakage can occur when surfaces that are designed to make contact with the casing are rough or irregular. Leakage reduces the power output by allowing steam to bypass multiple stages, and therefore missing an opportunity to produce power in those stages. Inner and outer casing repairs help to ensure that the casing fits are smooth, level and uniform. The single flow low pressure (LP) last stage wheel was rusted, while both ends of the double flow LP last stage wheel were not. 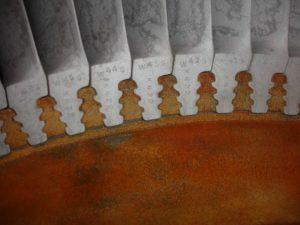 This pattern suggested an anomaly because the turbine is designed so that steam conditions are the same at each of the back ends. In addition, damage was found on the LP turbine steam seal end packings. The audit recommended that the source of the rust on the rotor at the SFLP L-0 location be investigated and corrected through analysis of operating data, specifically that of the steam seal system. 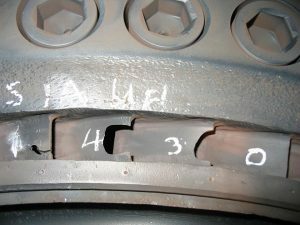 Furthermore, fillet welds on the outer diameter of the last stage diaphragms were undermined halfway through the welds, posing a reliability concern. 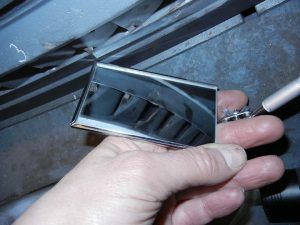 The audit recommended checking the integrity of the L-0 diaphragm welds. Steam path audits by MD&A routinely show that maintenance budgets can benefit at least two ways: first, by helping managers spend money on maintenance items that bring the greatest return, and, second, by helping them avoid making costly investments for items that fall short of the desired ROI. What’s more, a timely investment in following the steam path audit recommendations can result in as much as a 10x savings in fuel costs through efficiency improvements. Schedule a steam path audit today, call Deborah H. Cioffi, P.E. at (518) 399-3616 or use our Contact form.